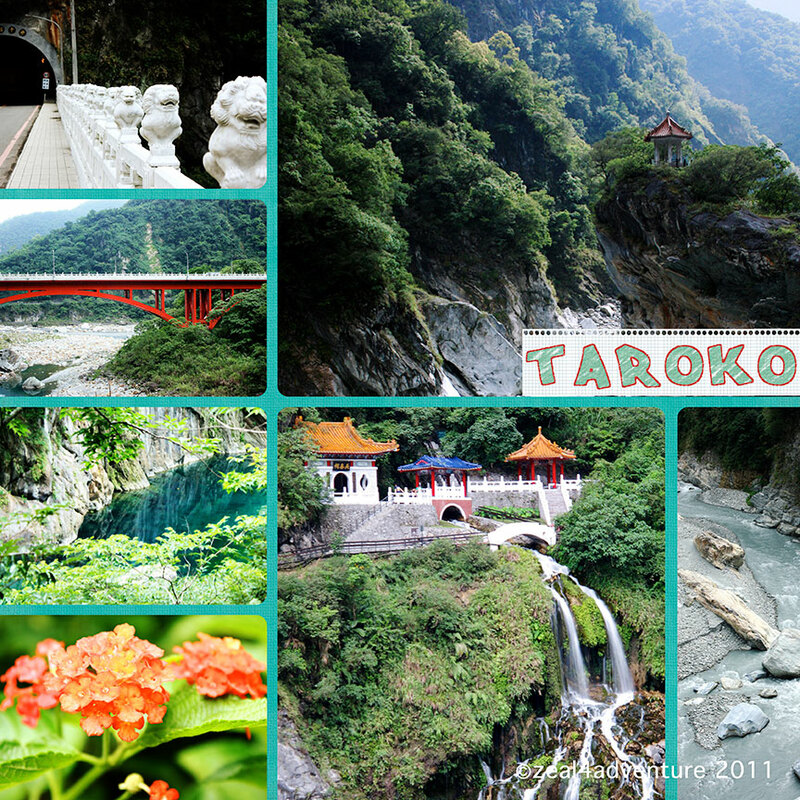 If rugged cliff, marble canyons, towering mountains, and cascading rivers are your thing, then the Taroko National Park will surely enchant. Hungry for more after our morning’s meanderings, we decided to book a tour to cover more grounds. A must if pressed for time, actually. A taxi came for us after lunch, turns out that he is both taxi driver and English-speaking guide. He said the need for an independent tour guide (and an English-speaking one to boot) has declined now that more Chinese tourists arrive by the busloads providing their own tour guides, hence the dual occupation. 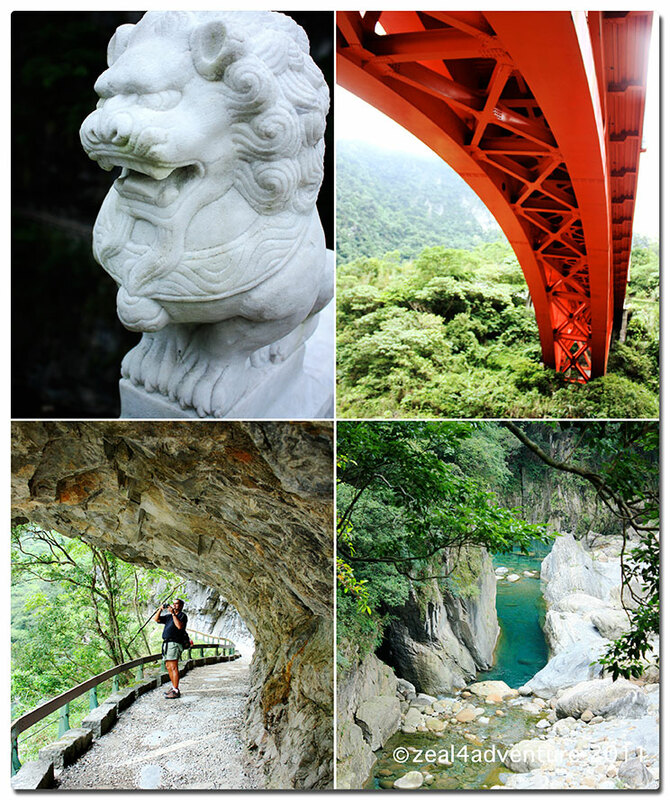 One can spend the day exploring the breathtaking scenery on foot and not cover half the park, which by the way, is the 2nd largest national park in Taiwan. 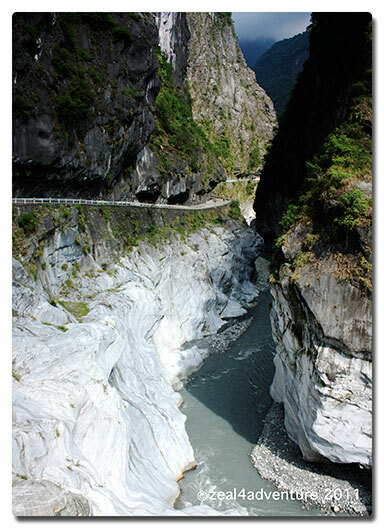 The gorge itself spans 19km long and is spectacular whichever angle you see it from. With a car, we managed to cover a lot. Besides, wandering on foot requires a bit of stamina, stamina that has substantially diminished after our morning walk. The trail we walked earlier apparently does not end at the highway, if we crossed it and walked north, we would have hit a tunnel that splits into two. We earlier thought about walking along the highway but worried about getting hit by the buses or be charged with jay walking. Anyhow, traffic and tourist buses are heavy near the tunnel. The right side of the tunnel is off-limits to vehicles and one gets to explore the tunnel and its surrounding by foot. Long-term erosion by the river resulted in holes and hollows on the cliffs. Swifts and swallows took up residence here giving the place its name. 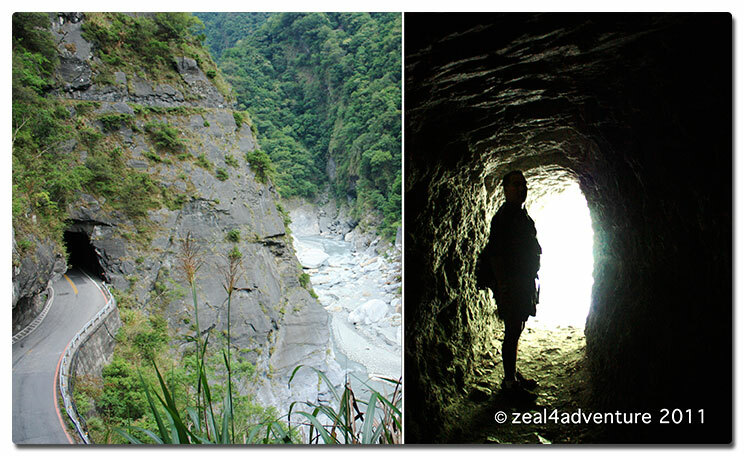 Gorgeous valleys and splendid views awaits as one walk further into the tunnel. A part of the trail was closed due to falling rocks when we visited and so we turned back. 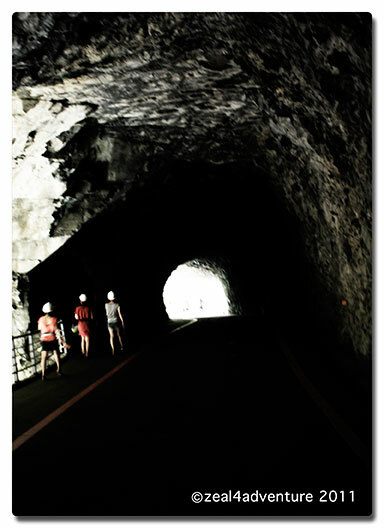 Normally, our guide said he’d wait at the end of the tunnel while his guests walk the entire stretch. 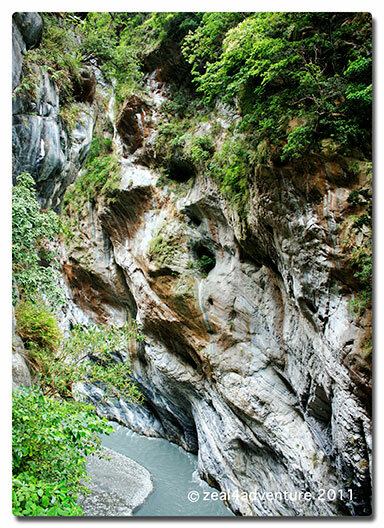 The scenery from the Swallow Grotto to our next destination is quite spectacular where the highway runs mostly through tunnels, narrow gorges and marble sceneries. 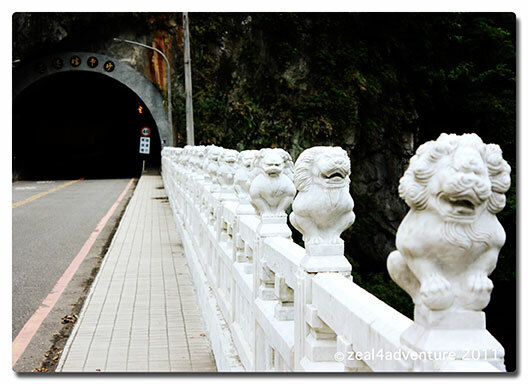 At the confluence of the laoxi and the liwu river stands Cihmu Bridge, an H-shape hanging bridge where marble stone lions stand on each side. The rock beneath is of schist and white marble, resembling a frog with a crown (can you see it? 🙂 ). The crown is actually a pavilion built on top of the frog-like rock. Our driver/guide recommended that we walk this trail. He dropped us off where the trail started and he’ll meet us at the end, he said. 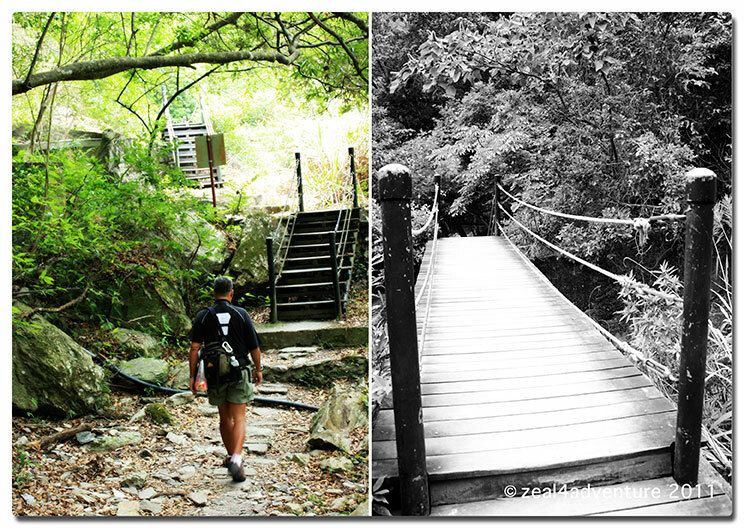 The trail climbs gently uphill and crosses a short suspension bridge before making its way onto a spectacular cliff-side section. 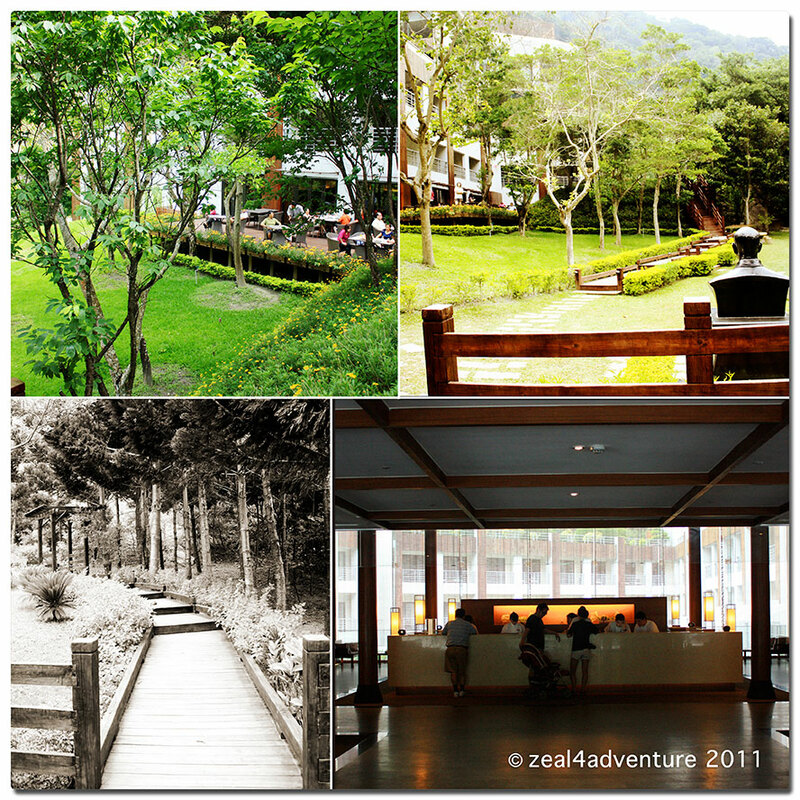 It was a fairly easy and very scenic trail that is suitable for people of all ages. 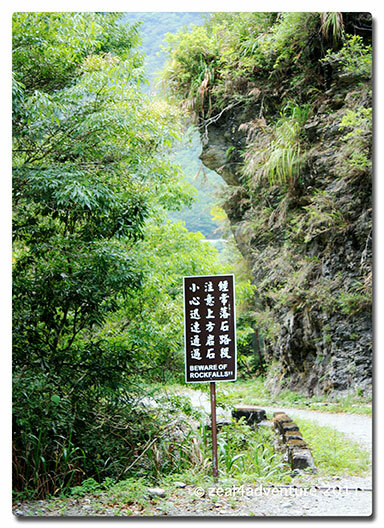 The trail follows the road cutting through the mountain and passing through a short tunnel. 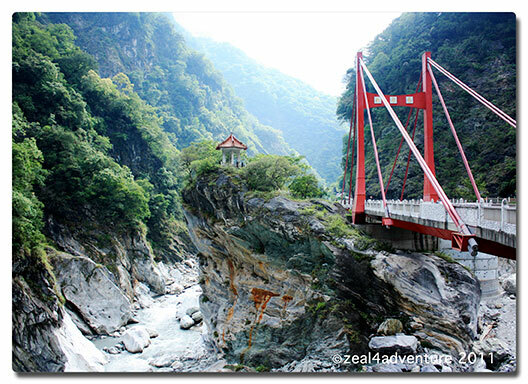 The views of the Liwu River and the gorge are impressive. A kilometer of rough downhill road signals almost the end of the trail bringing us back to the main road along the rim, our taxi in sight. 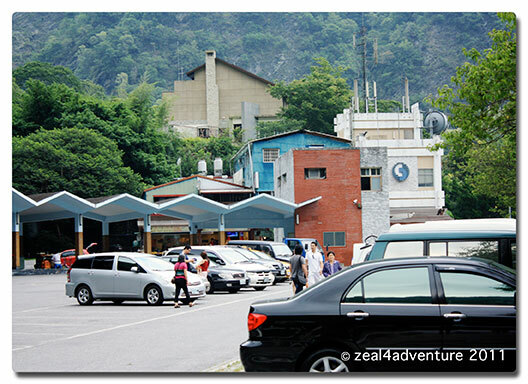 Like Buluowan, Tianxiang is an old Atayal aboriginal village sitting near the confluence of the Daxi Jili and Dasha rivers that eventually becomes the Liwu River. Its name commemorates Wen Tianxiang, the last prime minister of the Song Dynasty. 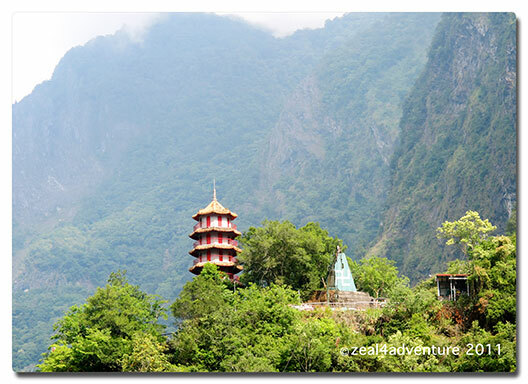 This charming town has a large parking space for tourists, a recreational plaza garden and the only 5-star hotel in Taroko – Silks Place. From the road, driving to our next destination, we stopped only to take photos (as many have done) of the Eternal Spring Shrine, a landmark and a memorial shrine complex paying tribute to the 212 veterans who passed away during the construction of the Central Cross-Island Highway. 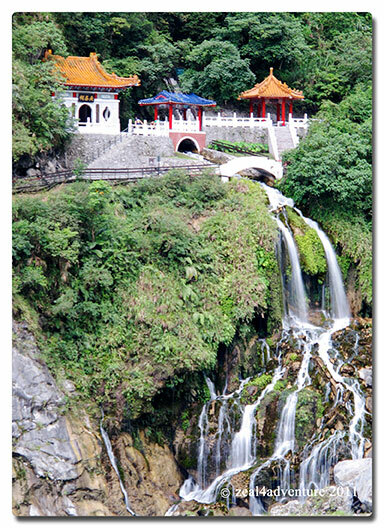 The shrine surrounded by lush greenery and the long steep gorge beneath was built above the Chang Chun falls offering picturesque view of the mountain and the waterfalls. 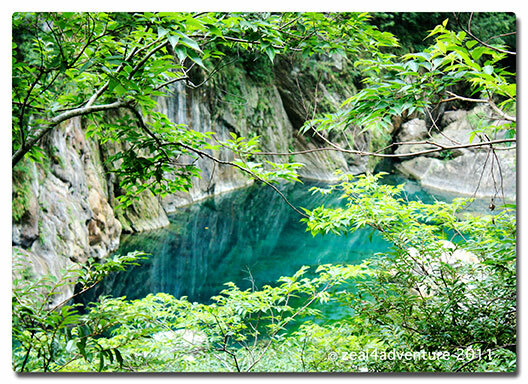 The Chang Chun falls runs year-round. Bridge near the Shakadang Trail entrance. Each lion has a different face. 5pm, hot and hungry and we still had one more to go. We were thinking to perhaps skip it but our guide insisted that we walk even just a portion of the trail. Glad we did. 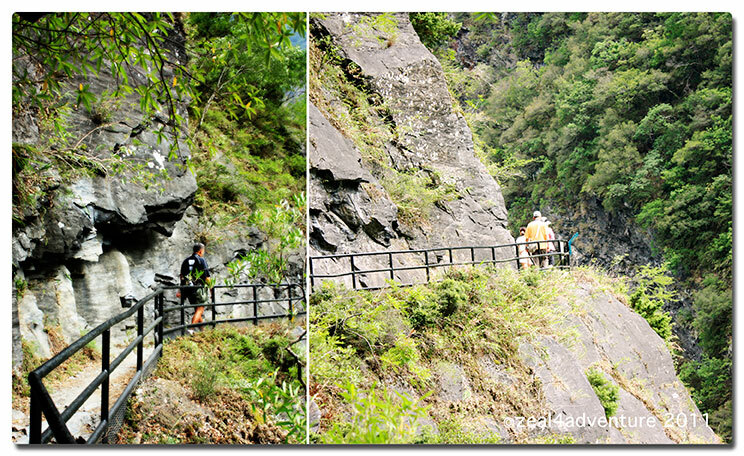 It was an easy hike, which started just below the bridge, along the Shakadang creek valley, a tributary of the Liwi River. 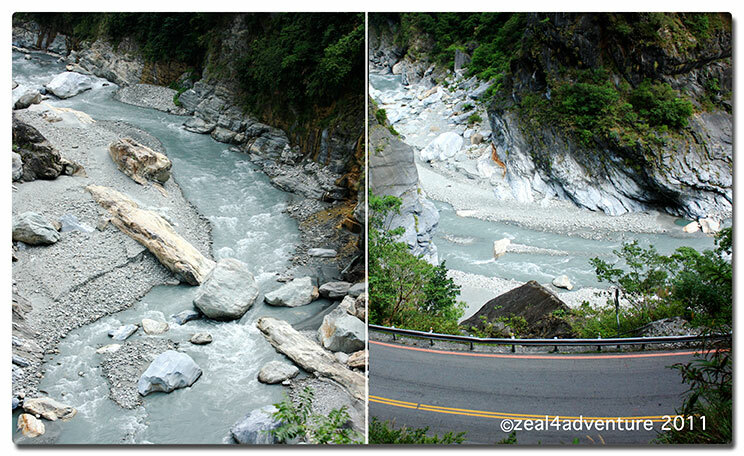 The trail is a flat 4.4km following the crystal clear blue water of the Shakadang River which winds through dramatic marble canyons surrounded by lush green vegetation. 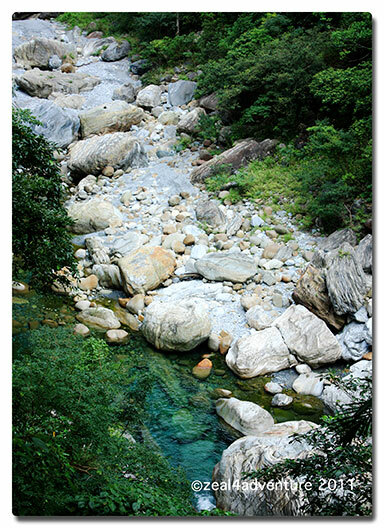 The mineral deposits in the rocks produces such beautiful turquoise water and is a major part of the charm. And with that, we were driven back to our hotel just in time for my aboriginal dinner. 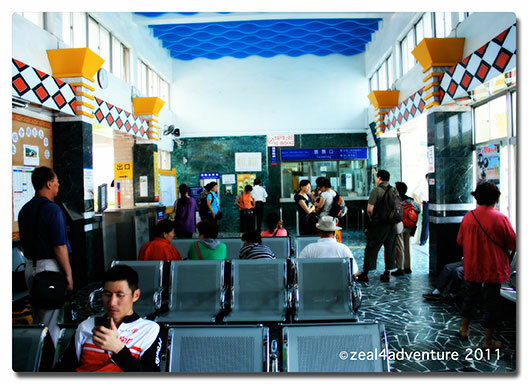 We headed back the next day to Taipei the same way we arrived, impressed with what Taiwan had to offer, realizing that we perhaps scratched only a small surface of this beautiful island once aptly called Formosa. Another visit is definitely likely to happen in the (near or far) future. That is an amazing adventure. You’re right, every angle is beautiful, but isn’t it scary walking or driving through the ledge. That 2nd photo with the street etched at the side of the rock is really awesome, but i might get height sick there! I only saw something like that in Sabtang, but not the street is not as long. 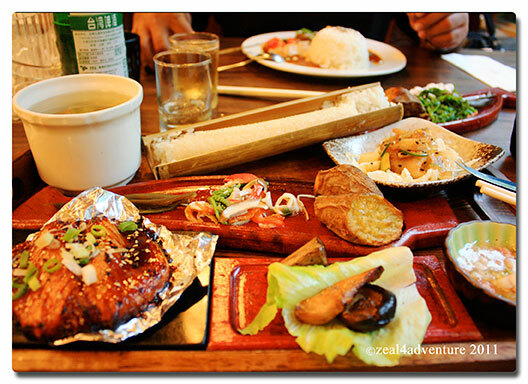 I will show my friends your post, hoping they will be enticed and we will follow your route. this is definitely my kind of spot. thanks for sharing. happy new year.